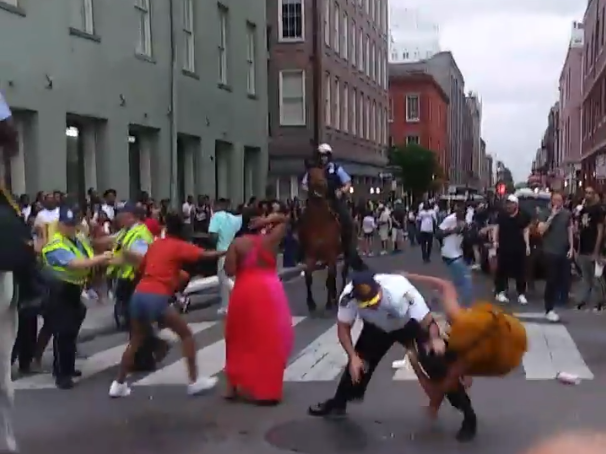 The New Orleans Police Department is investigating the actions of a district commander after a video showing him aggressively tossing a woman to the ground went viral on social media this weekend. NOPD has confirmed that the officer in question is Commander Octavio Baldassaro, who was recently promoted to lead the 8th District. The woman appeared to be involved in a fight that a group of officers, including some on horseback, were attempting to break up. Taylor Bruce was arrested on charges of disturbing the peace (two counts), resisting an officer, battery of a police officer, and tampering. Another woman, Torian Lewis, was arrested for disturbing the peace. In addition, Superintendent Ferguson has opened a formal disciplinary investigation after reviewing the video. You can see the full video below.